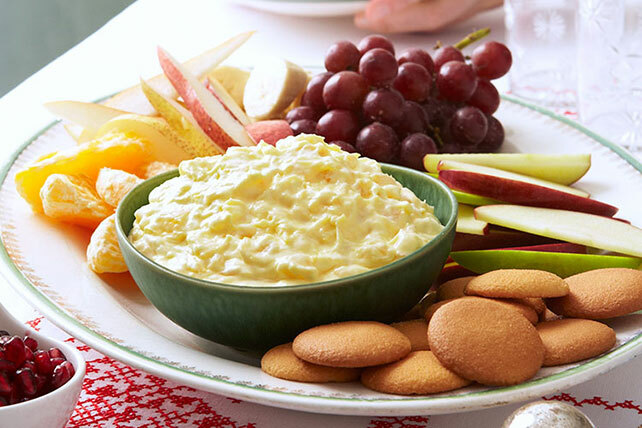 Serve up this summertime Pineapple Lush Dip after watching our video tutorial! This sweet, fruit-filled appetizer is great for any occasion. Add dry pudding mix to pineapple in medium bowl; whisk 2 min. For a colorful presentation, serve with 12 vanilla wafers, 1 sliced fresh pear, 1 each sliced red and green apple, 1 cut-up banana, 1 sectioned orange or tangerine, 1/2 lb. seedless red grapes and 1/4 cup pomegranate seeds. Refrigerate any leftover dip, then layer with cut-up fresh fruit in parfait glasses. Or, serve spooned over slices of pound cake. This super-simple dip can be prepared ahead of time. Refrigerate up to 3 hours before serving.